Starting nursery is a big step for you and your child so we want to make sure you are both ready for your new adventure and are familiar with our staff and other children. Therefore, we work with you to create a settling-in programme before starting so you can meet our team while your little one can have a play and meet their new friends. We will discuss how we will assess your child and how we will feed back about your child’s day and their progress. You will have chance to complete and discuss your child’s “All About Me” form with the key worker so we can find out what your child’s likes, dislikes and routines are. You will have the chance to go through and request a copy of our Company Policies and Procedures. The welfare and protection of every child in our care is of paramount importance; we therefore have strict procedures in place when it comes to mobile phones, photography and the collection of children from Minibugs please see our Safeguarding Policy for further information. We ask that each child comes to nursery and pre-school with sufficient and suitable clothing for their daily needs and that all clothes are clearly labelled. Parents of babies and children who are not fully toilet trained should provide enough nappies to last the day. We also kindly ask that children do not bring valuable items with them, as we cannot accept responsibility for any loss or damage. Formula or expressed milk must be supplied by the parent/carer in bottles clearly labelled with your child’s name. This must be passed to the Nursery Manager or Key Person on arrival for safe storage in the refrigerator. Any medication brought into nursery/pre-school must be clearly labelled with your child’s name and date and given to the Nursery Manager who will ask you to sign a permission slip to administer that medication. See our Medication Policy for more details. 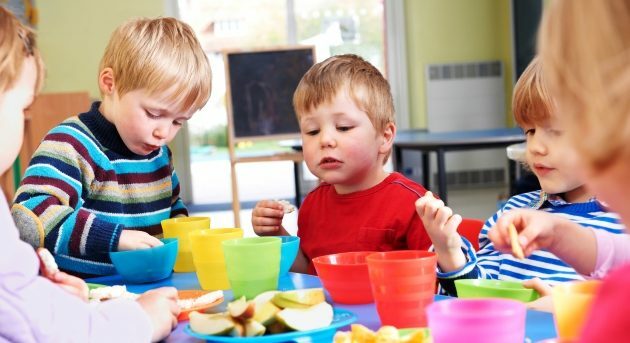 We promote a healthy eating and living culture at Minibugs so we make sure that every meal is balanced and that children eat regularly. Our meals and snacks are freshly prepared and cooked every day by our onsite cook. They will cover a four-week period giving your child the opportunity to try different foods and develop their taste buds. Cultural and dietary requirements are considered for all meals and snack times. We also encourage children to experience foods from different cultures. There are lots of ways that you can make your childcare costs more affordable. Here is some useful information and links to help you to access these benefits. From September 2017, this offer becomes 30 hours of free child care for working parents. When does my child qualify for a free place? For more information about your free grant-funded place please speak to your Minibugs Nursery Manager who will be more than happy to provide advice or support you to complete the forms to access your free funding. Some two-year-olds are entitled to two-year-old nursery funding. Two-year funding entitles a child to 15 hours of free nursery education for 38 weeks per year. At Minibugs every child is offered a number of free settling sessions to help them and you become familiar with the nursery and our staff. The number of sessions will depend on you and your child and how much time you both need to feel comfortable and confident in the nursery surroundings. We recommend a minimum of three be taken by every family but are more than happy to accommodate more to meet your individual needs. We offer parents a 5% discount for siblings. The discount will be applied to each child’s fees. This relates to non-funded hours only. If a parent signs up more than one (related) child at the same time the above sibling discount still applies and we will only charge one registration fee. A refundable deposit is still payable per child. For multiple (related) children of the same age, we will apply a 10% discount to the total fees. Please ask your Nursery Manager for more details. * Terms and conditions apply. Please note that Minibugs Nurseries reserves the right to cease discounts without prior notice. If you child is registered for a full-time place 5 days per week you may be eligible for a 5% discount. Simply provide the Nursery Manager with proof of employment with the identified employers eligible for discounts at each nursery site. Ask your employer about their provision of childcare vouchers. We accept all recognised childcare vouchers. If you require further information visit your companies childcare voucher scheme provider. This is available to working people who have at least one dependent child. The amount to which you will be eligible will depend on your individual circumstances. For further information, contact the Tax Credit Helpline on 0845 3003900. Fees are payable in advance on the 1st of the month. Fees will be calculated on a monthly basis, taking into account bank holidays. Additional sessions which commence mid-month will be invoiced at that time and are payable immediately. If starting mid-month, month one’s fees will be determined by your child’s commencement date with us. Please refer to the fee schedule provided by your Nursery Manager for fee details. Payment may be made by Standing Order, Bank Transfer or via Childcare Vouchers. Returned payments from the bank may incur an administration charge equal to any bank fees incurred by Minibugs Nurseries. Minibugs reserves the right to charge a late payment fee of 5% on any outstanding balance. Minibugs may serve 7 days’ notice in writing to terminate the contract. Upon termination of this contract your child shall cease forthwith to be admitted to the nursery and the initial £75 deposit is forfeited. Our opening hours are Monday-Friday, 7.30am – 6pm. Parents and carers are requested to adhere strictly to these times. A late collection will incur a charge of £10 with a subsequent £5 per 15 minutes elapsed. Recommend a friend to share the Minibug love. Happy children = Happy Parents. If you love our nursery and super Minibug nursery team, we would love you to share the love (bug) with your friends and family and receive a special thank you from us. £25 Love2Shop voucher per non-grant funded and grant funded recommended child. One month attendance is required by the recommended child before the voucher can be received. Current parents accounts must be up to date. No payment will be made if you are in arrears. Minibugs nurseries can withdraw this offer at any time. Minibugs nurseries reserves the right to change these terms and conditions at any time without prior notice. In any event that any changes are made, the revised terms and conditions will be posted on the company website. A copy of our policies and procedures for parents are available at each nursery for you to view or take away.